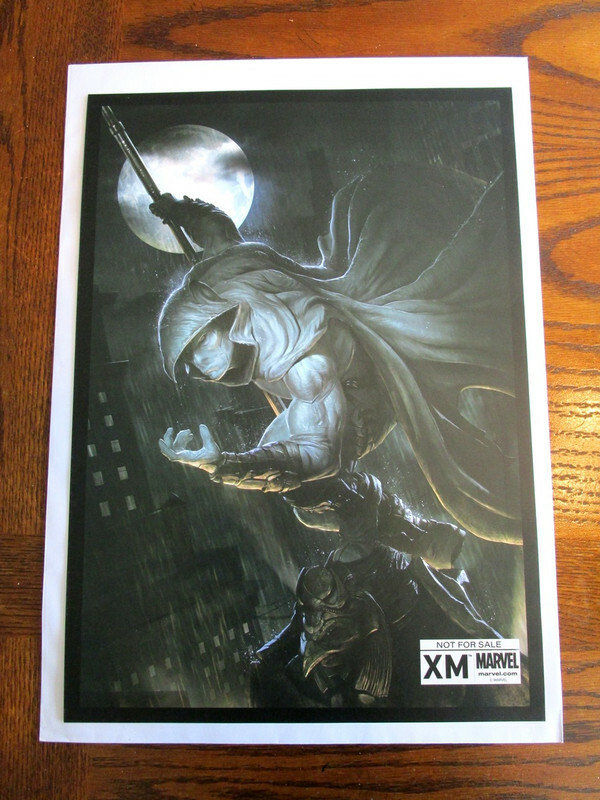 XM Studios proudly presents Marvel Comics’ chilling brand of vigilante justice – The Moon Knight. 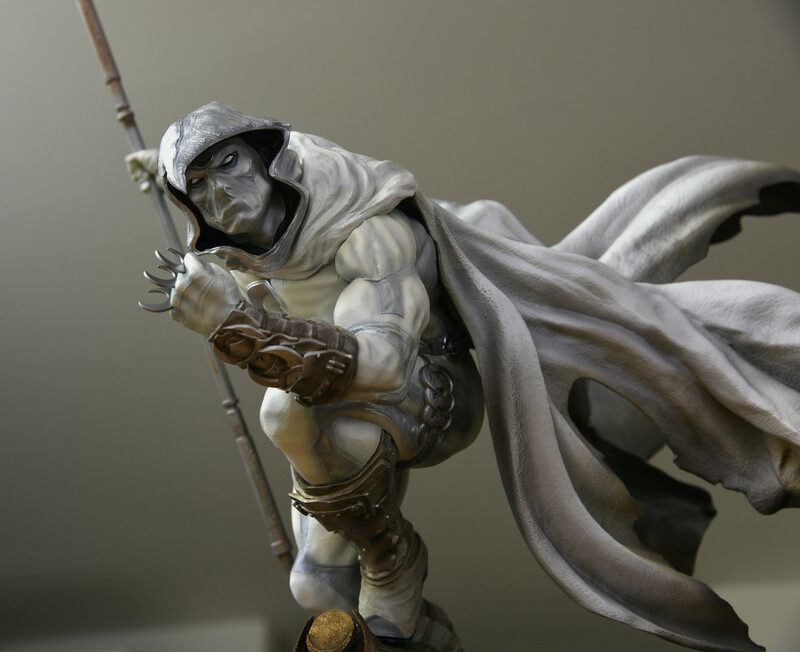 Attired in a cloaked, pearl-white, carbonadium armored apparel, the bearer of the mantle of Khonshu comes to life in this exceptional ¼ scale statue sculpted by a true master of the sculpted arts, Caleb Nefzen. 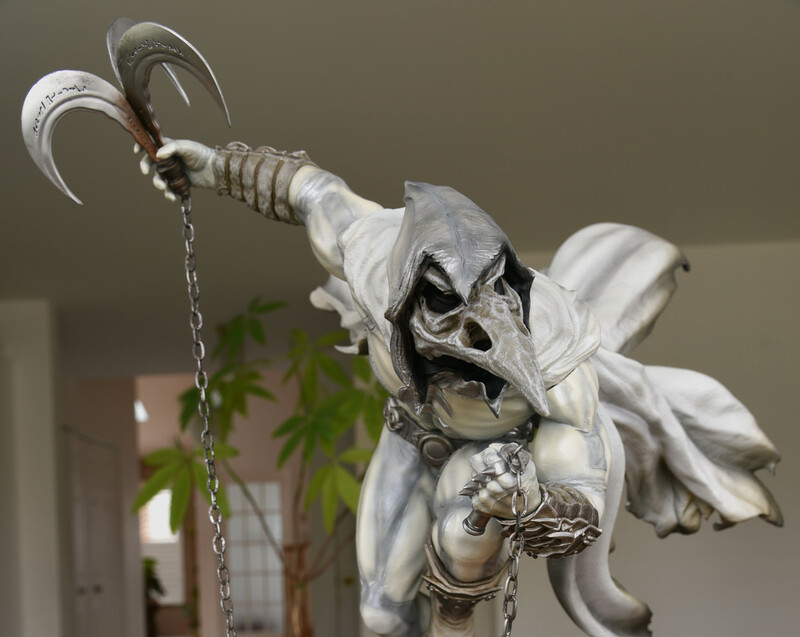 Perched atop an archaic stone-cut Egyptian monument like a bloodlusting bird of prey, Khonshu’s champion hovers high above the merciless back-alley streets of the City of Angels eager to strike fear and inflict punishment upon the wicked and contemptible. Moon Knight’s first appearance in the Marvel Universe was in Werewolf by Night #32, published in August 1975. He was created by the notable Bronze Age comics’ team of Doug Moench and Don Perlin. Perhaps not as widely known, Moon Knight was originally introduced to comicdom as a ruthless mercenary hired by “The Committee”, a cryptic conclave obsessed with studying lycanthropy, to capture Jack Russell (i.e., the Werewolf). 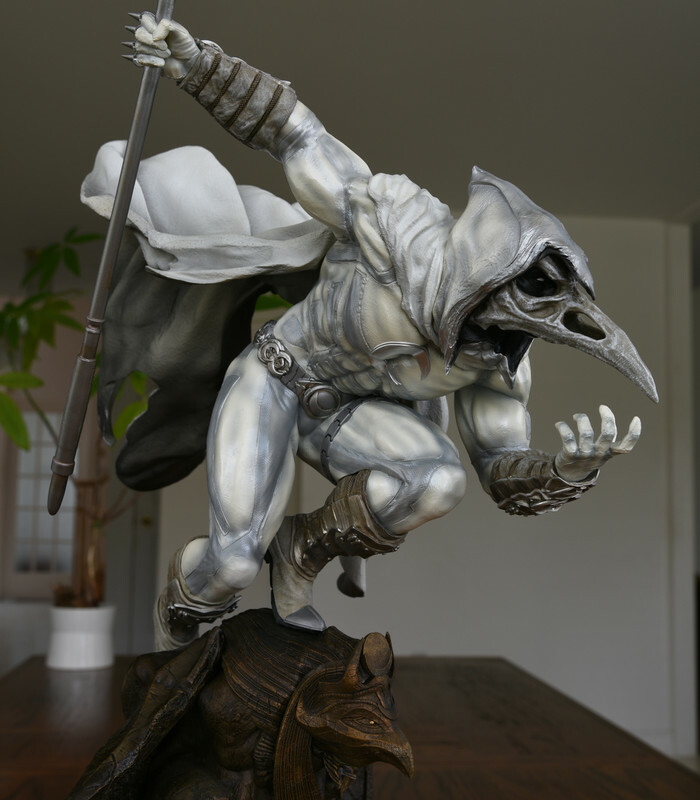 As is often the case in comics, the unwitting Moon Knight eventually became aware of the vile conclave’s sinister plans and helped Jack Russell escape their evil clutches thus showing readers that he was a champion of justice. Throughout the late 70s, Moon Knight would go on to appear in Spectacular Spiderman, the Defenders, and Marvel Two-In-One. At one point, Moon Knight also had his own back up strip in Hulk Magazine. However, Moon Knight didn’t truly hit his own stride until Marvel launched his own title in 1980. This remarkable ongoing series, which served to firmly establish Moon Knight’s supernatural origins, was written by Doug Moench and penciled by the incomparable Bill Sienkiewicz. Briefly, following his gruesome death at the hands of the sadistic Bushmaster for refusing to contract-kill children, Marc Spector, mercenary for hire, suddenly found himself brought back to life by the Egyptian God of justice and vengeance, the moon god, Khonshu. However, this second chance at life came at a heavy price. 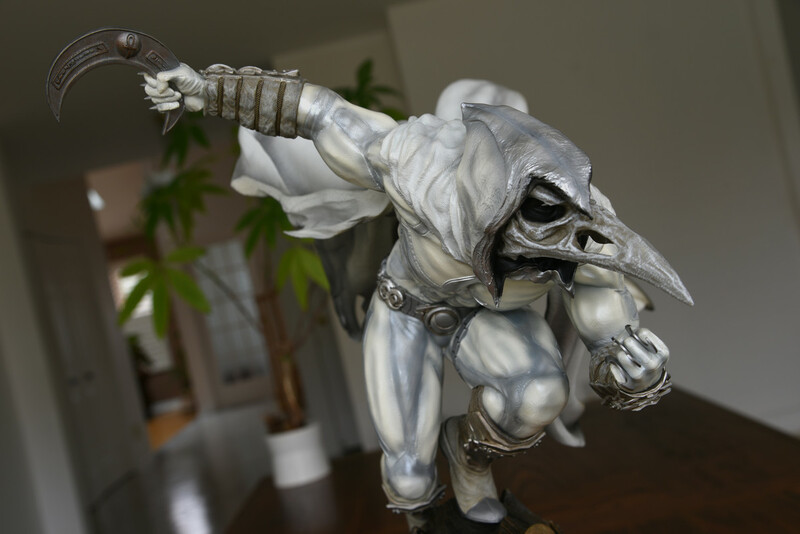 As recompense, Spector agreed to fight evil on Khonshu’s behalf, at which point, he donned the traditional robes of Khonshu’s priests and became the Moon Knight, the quintessence of Khonshu’s will. XM Studios presents the fanbase with a truly macabre interpretation of an unconventional hero consumed by madness. For those perhaps unaware, Marc Spector suffers from a dissociative identity disorder which fractured his fragile mind into 4 distinct personalities, i.e., Jake Lockley, Steven Grant, Marc Spector, and the lunar legionnaire, Moon Knight. 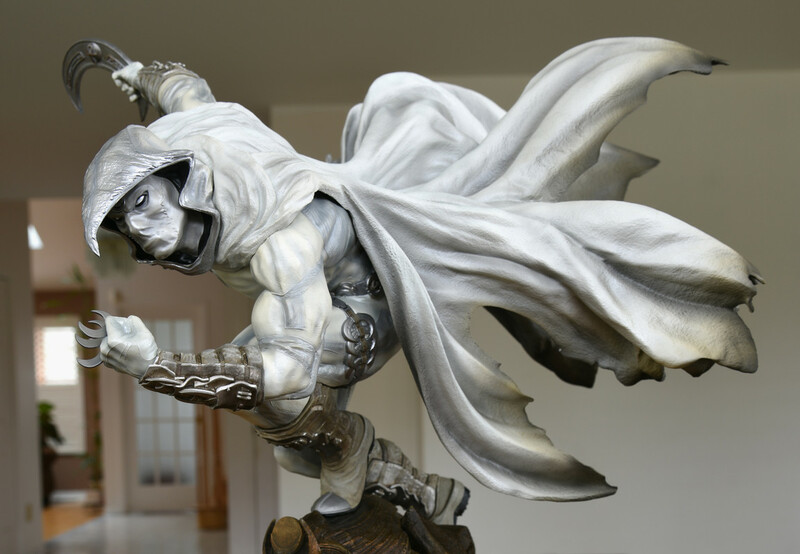 The extraordinary creative team behind the Moon Knight statue are Caleb Nefzen (sculpt) and the XM Studios Design & Development teams. 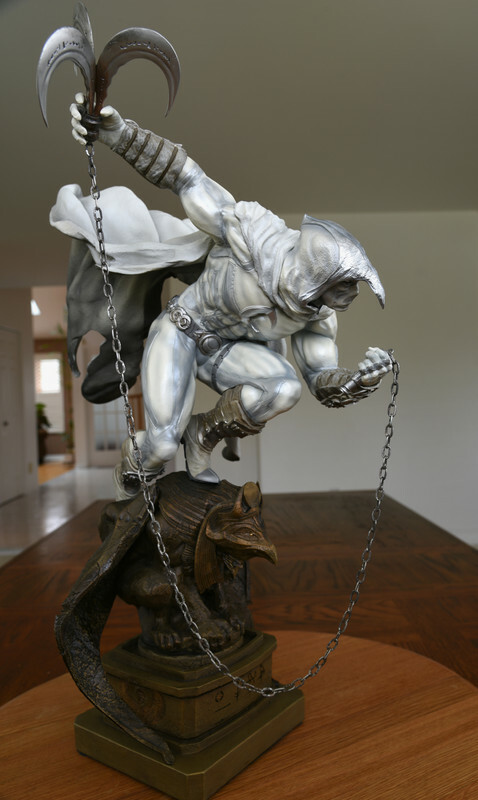 The Moon Knight statue stands an impressive 26 inches high (i.e., when displayed with his truncheon), 24 inches high (i.e., when displayed with the grappling hook), 22 inches high (i.e., when displayed with the crescent boomerang), 19 inches wide, and 16 inches deep. 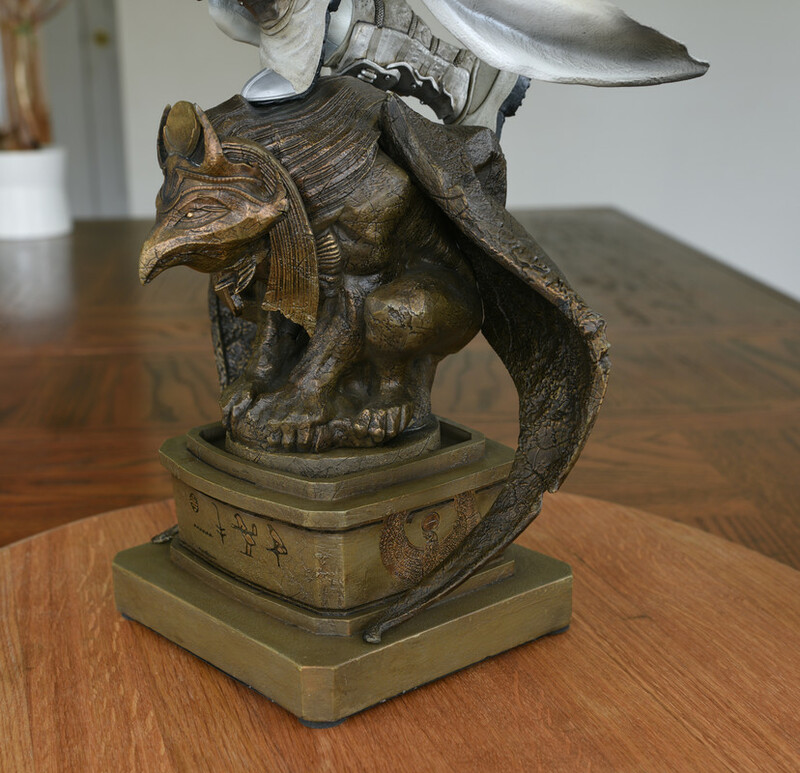 The statue weighs approximately 17 pounds. It was limited to only 270 pieces worldwide at a retail price of $990 SGD (approximately $720us). 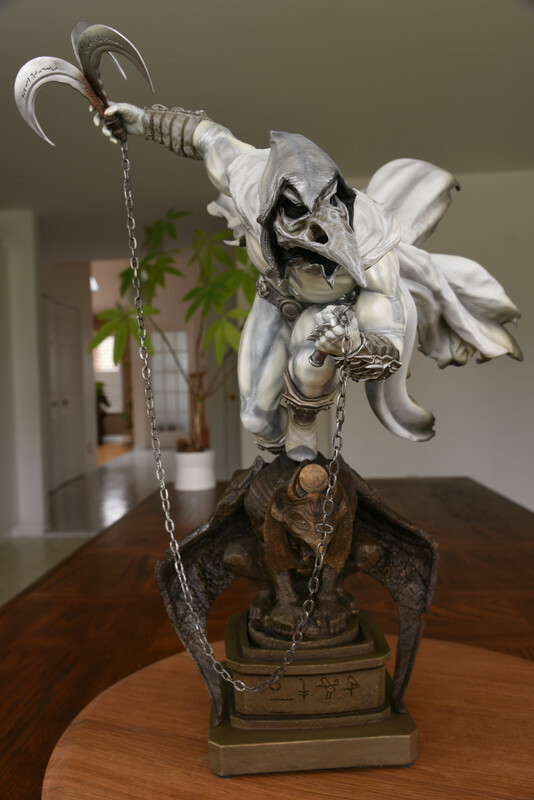 The Moon Knight statue comes in 12 pieces: 1 Moon Knight body, 2 portraits, 4 switch out hands, 1 switch out hands with chain, I cape, 2 wings to attach to the base, 1 base, and a full color print. 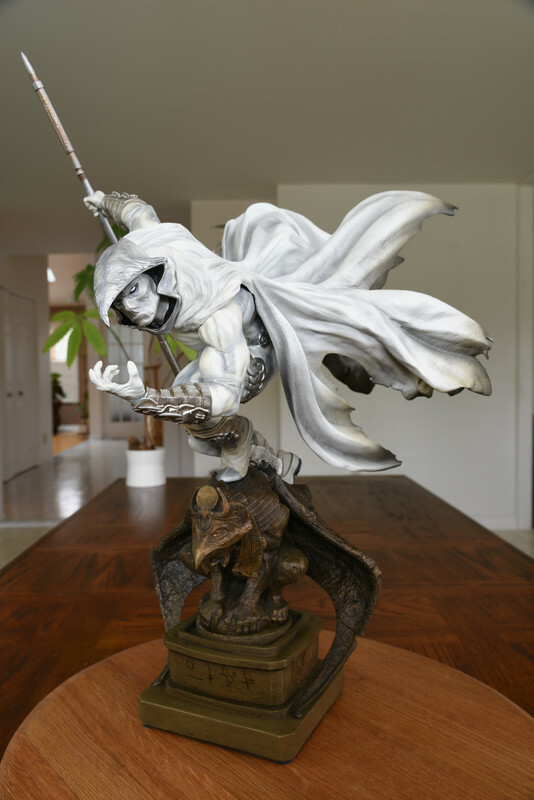 XM Studios began shipping out first batches of this release to Asian markets in early November 2018. Sculpture: This is an extraordinary sculpture. 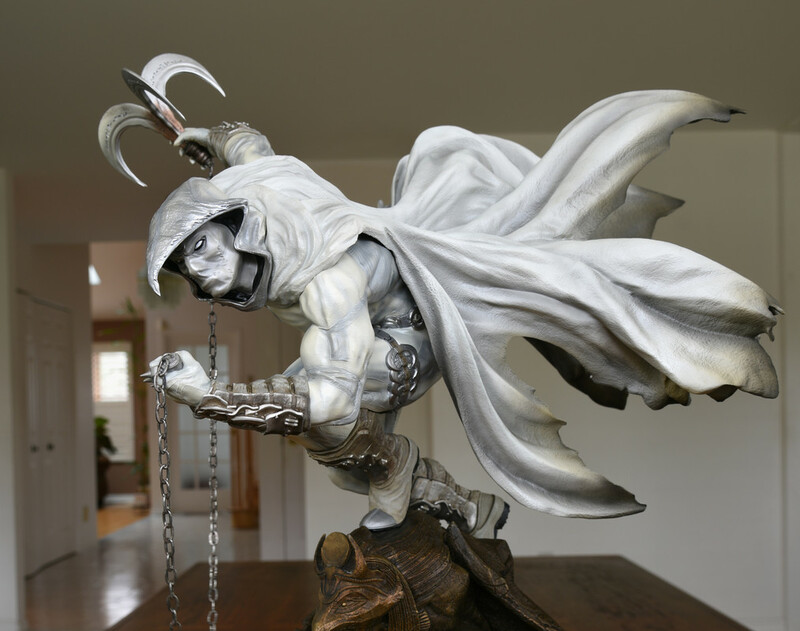 Caleb Nefzen, the sculptor, brilliantly channels into Moon Knight’s savagery and despair. He vividly captures a moment when Moon Knight appears to become unhinged and loses sight of whatever may be left of his fragile grasp of his humanity. 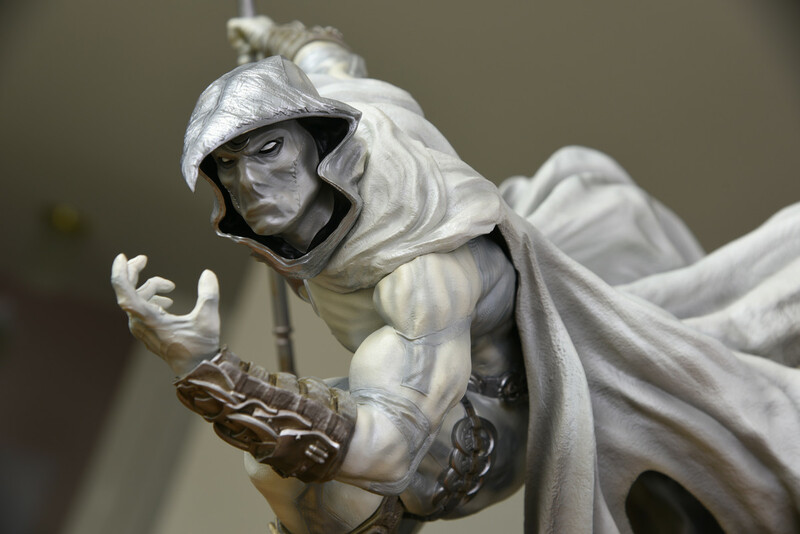 As Moon Knight, he becomes unrecognizable, even monstrous, as he helplessly descends further into his madness, and thus prompted to complete his ultimate mission to cleanse the world of depravity. 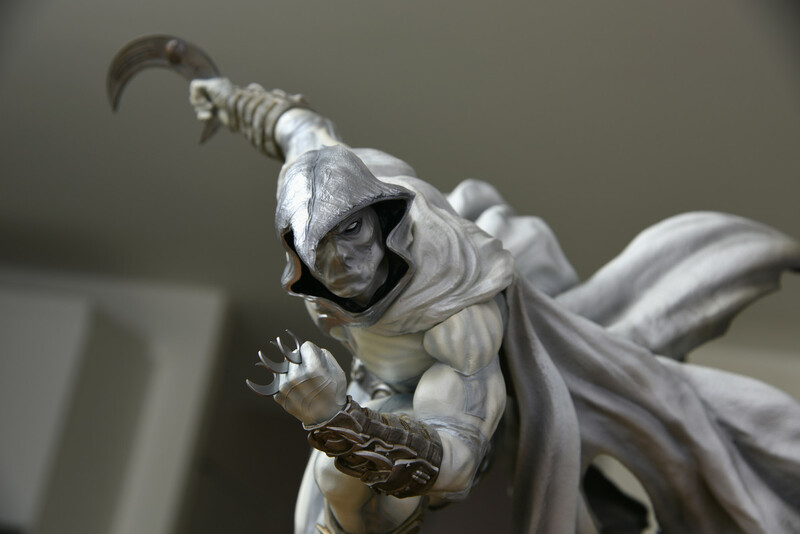 Possessed by the moon god of vengeance, Khonshu, the Moon Knight becomes a sadistic reaper of vengeance. The weapons – there are a blissful many. As Marc Spector is a billionaire, he can afford to invest in state of the art technology, armor and weaponry. Along his thighs and belt are throwing crescent darts which he uses to stab and subdue his quarry into woeful and painful submission. 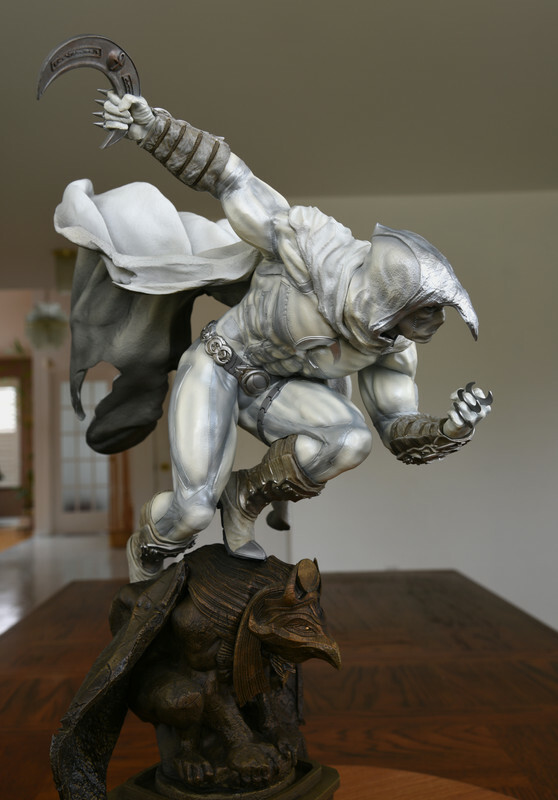 Incidentally, Moon Knight has also been known to permanently brand his prey with his crescent insignia on their forehead to serve as a warning to the degenerate criminal underworld that he is watching, that he is always watching. One of Moon Knight’s gloves are equipped with razor sharp spiked knuckles. 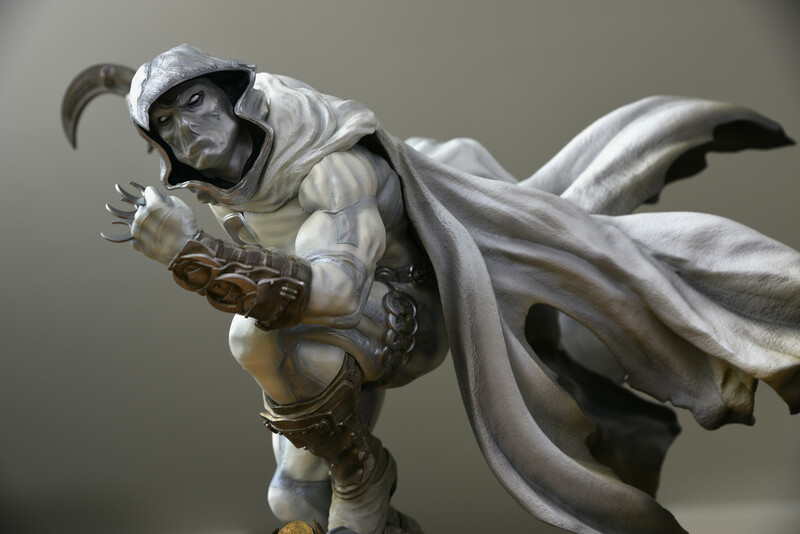 When he’s bare-knuckle street-fighting, where he appears to thrive most, Moon Knight typically shows no mercy and will often leave his victims lying in a pool of their own blood, barely clinging to life, in a dimly lit, filthy and decrepit alleyway. 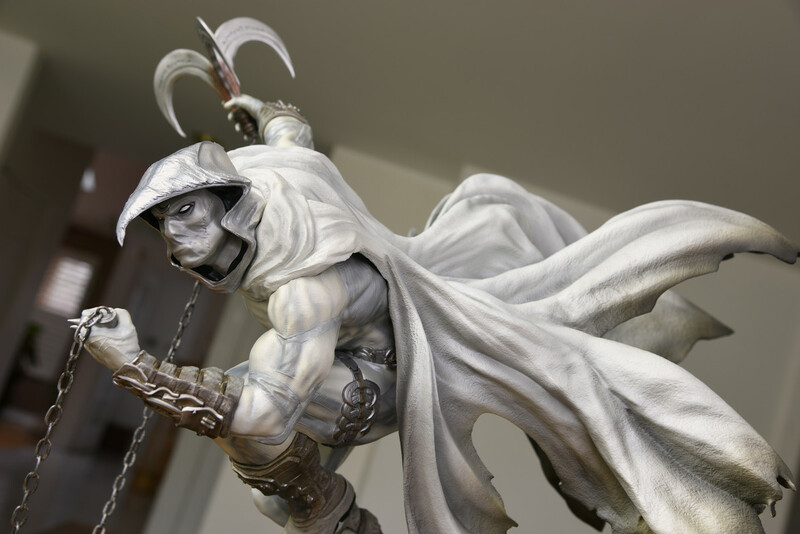 Perhaps the more chilling of the numerous display hand-options is the one where Moon Knight’s grappling hook dangles loosely in his hand, as if his hunted down criminal game already lies defenseless and panic-stricken by his feet, just waiting for Moon Knight to exact his sadistic vengeance upon him. While his grappling hook may be used to swing from one rooftop to another, it may also be employed as a means to ensnare his victims into submission. Another remarkable weaponry-related display option features Moon Knight’s truncheon composed of a flexible adamantium blend. It’s a multi-purpose weapon which can be used as a bo-staff, grappling hook, baton, nunchaku, or cane. This clever device can also be used as a blunt force instrument to render villains unconscious. There’s another a switch-out hand which wields this large-sized crescent-shaped boomerang with Egyptian engravings, and another which features a closed fist with smaller throwing crescent darts, and finally, an unarmed open hand. 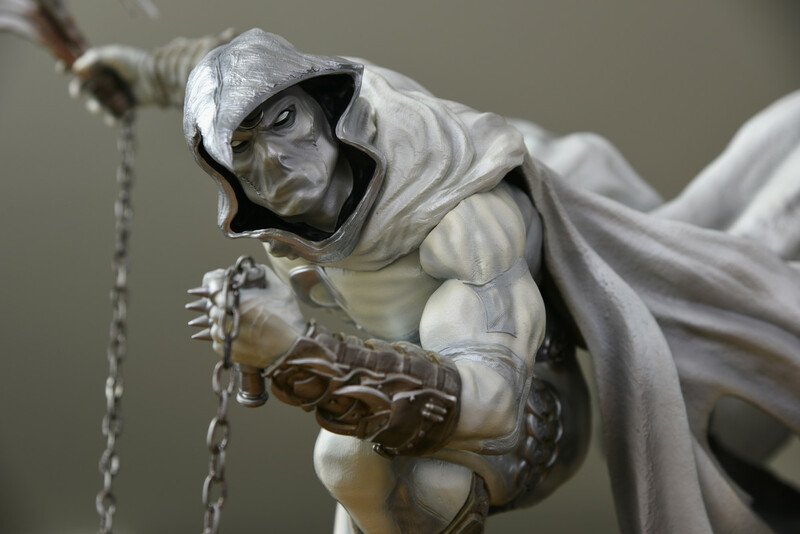 Moon Knight’s wraith-like glider cloak appears singed and tattered, making him seem like the stuff of nightmares, as if he were a demonic denizen from some nameless dark abyss hell-bent on creating Hell on Earth. The intent is to strike paralyzing fear and panic in the twisted and cruel – and it works, flawlessly. 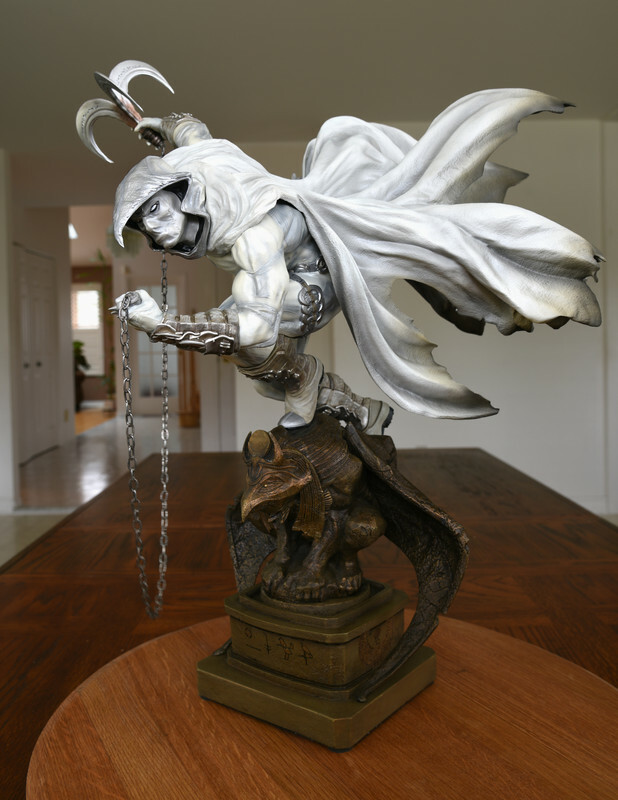 The sculptor, Caleb Nefzen noted that he intentionally imbued a chaotic imagery into the cape in order to encapsulate Moon Knight’s maladjusted and splintered personality. There are two portrait display options. The first and more iconic familiar portrait features the cowl and mask. I absolutely love that you can see the stitching along the sides of his mask, making him look more deranged and obsessed with the mission Khonshu laid out for him. The mask also accentuates his maniacal facial features as he seems unwavering and resolute. The second portrait looks like a horrifying bird-skull death mask. 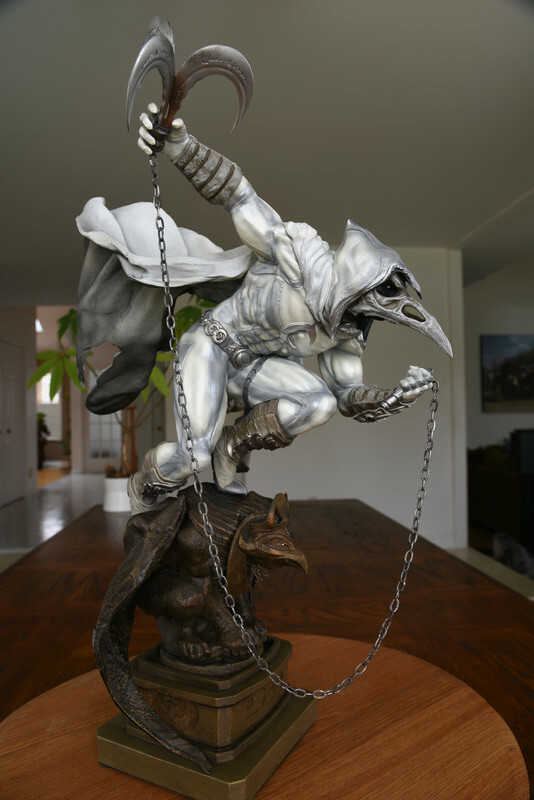 This portrait, especially, serves to depict Moon Knight’s psychosis and humanistic decay. It’s a frightening image as the death-mask actually looks like it is made of bone. For those unaware, in the comics, the death-mask is worn over the traditional mask he typically wears. I’m sometimes asked what my preferred display option would be. I actually really like both portrait options, however, I’m partial to the classic portrait featuring the grappling hook as it delightfully captures the ideal personification of the character for me. The primeval base marked with ancient Egyptian encryptions and hieroglyphics serves as a monument to Khonshu, the winged Egyptian God of the moon. There’s a tremendous amount of detail laid out on this base. It looks timeworn and decrepit, like it’s been resting in an undisturbed tomb for centuries. There’s just enough deterioration, cracks, and fissures to make it seem authentic. 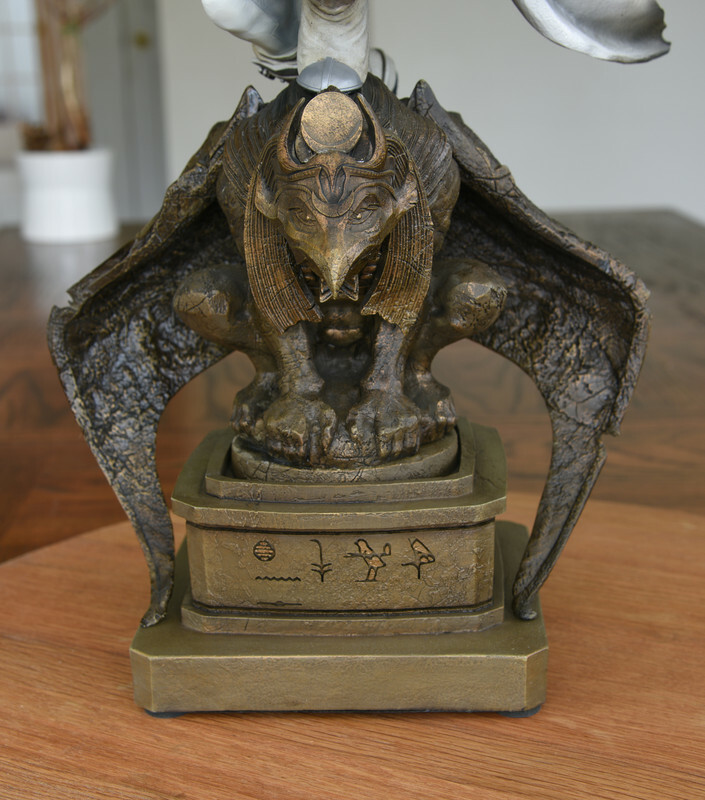 This clearly was a labor of love for Caleb Nefzen, the sculptor, who excels in imagery of dark fantasy and the macabre. Excellent work. I believe as a fanbase we have only begun to scratch the surface of the imagination of this fascinating creative mindset. 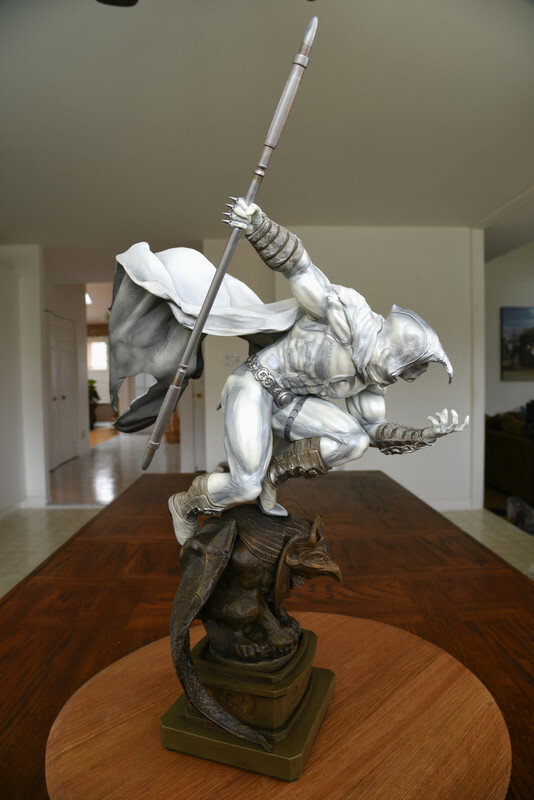 Paint/Mixed media: Silver and pearl white are the major color schemes used in this cold cast porcelain sculpture. The mix of shading is superb in that it allows for movement and fluidity. The shading also presents this sense of battle-wear which is essential for Moon Knight as he typically fights crime at the street level. The boney-white and decay paint scheme on the bird-skull death mask looks genuine enough to be confused for the real thing. 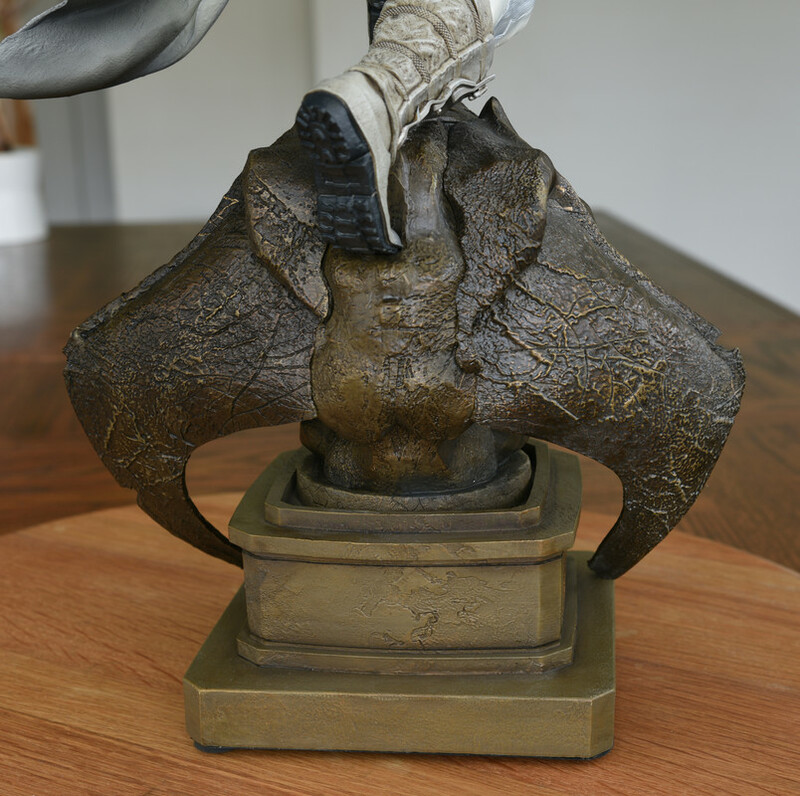 The grappling hook uses actual chain materials giving the piece an additional sense of realism as well. The gold panache used on the Egyptian themed base also features a blend of shading in order to best embody this feeling of age and history, yet it still allows for the hieroglyphics and textures of the Egyptian deity to seep through beautifully. There was no significant painting over lines, smudges, or off-centered eyes. 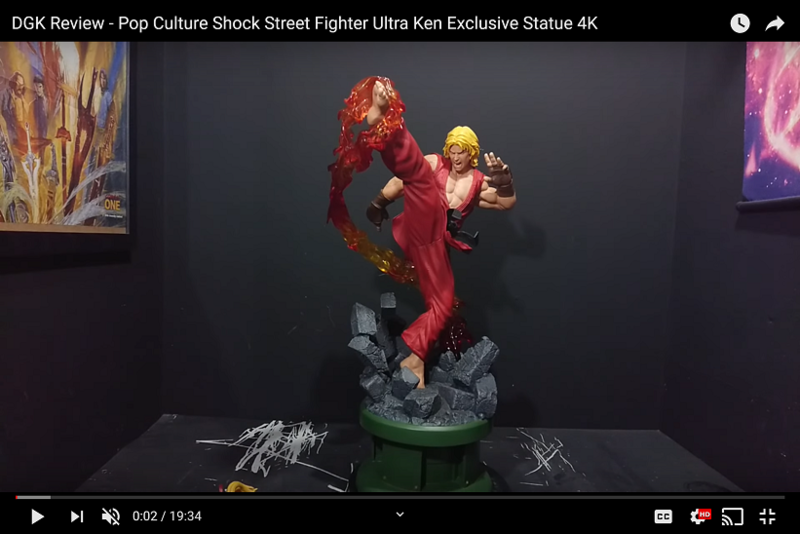 However overall, I think I would have preferred a less pristine looking paint application as it might have better represented the generally battle-focused vigilante’s street level fighting style. Production and Build quality: As a general rule, when it comes to XM Studios, you can typically guarantee that you will be receiving a solid piece of craftsmanship. 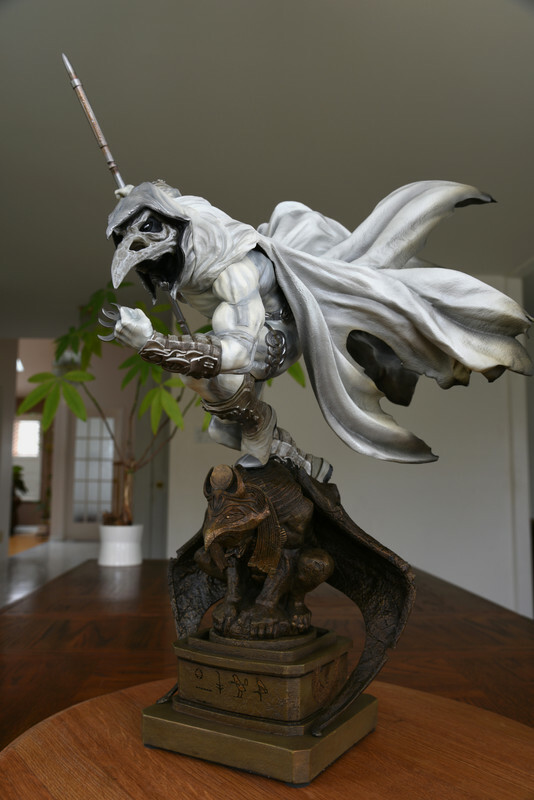 The Moon Knight has a fabulous size, shape, and weight to it. The magnets and pegs worked really well. There’s no tilting or imbalance to the statue or cause to be concerned about long term leaning issues. The weaponry featured on this sculpture look very well defined too. Ideally, I would have preferred a larger base, if only to present a more grandiose and ominous design worthy of Khonshu, however, I do not think the smaller, less intimidating-looking base takes much away from the artistic intention. However, there were some issues with the production quality worth mentioning. By Moon Knight’s left shoulder (i.e., deltoid area), right below the cape placement, there are some visible gaps. I did my best heat the cape into place so it could cover those gaps but I couldn’t address all of it, however, I did come close. 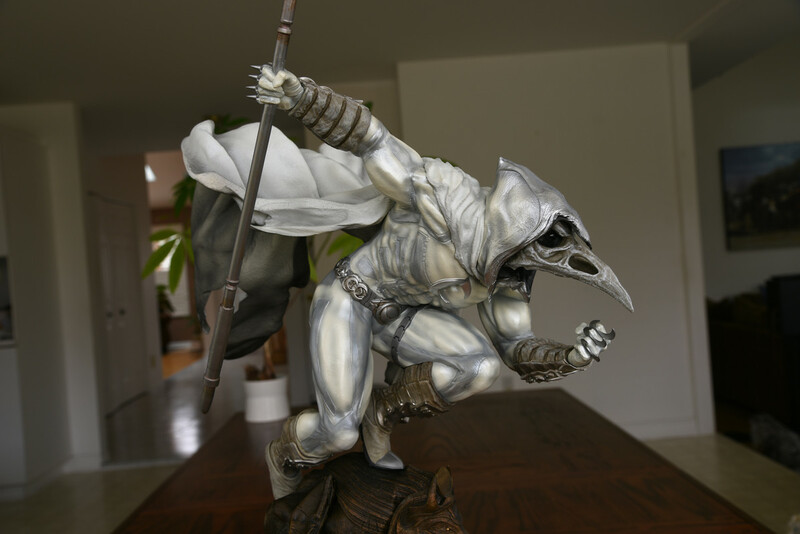 Also, while the magnets on the masked Moon Knight portrait worked perfectly, it didn’t quite fit perfectly so there is a slight gap there as well, though less visible than what we see on the shoulder area. However, again, heating up that area did help minimize that gap area. Lastly, the cape presents as really fragile. While I’m told this thin material/texture is actually a new durable formula being used by the factories, I would nonetheless highly recommend being super careful when placing it on the body. 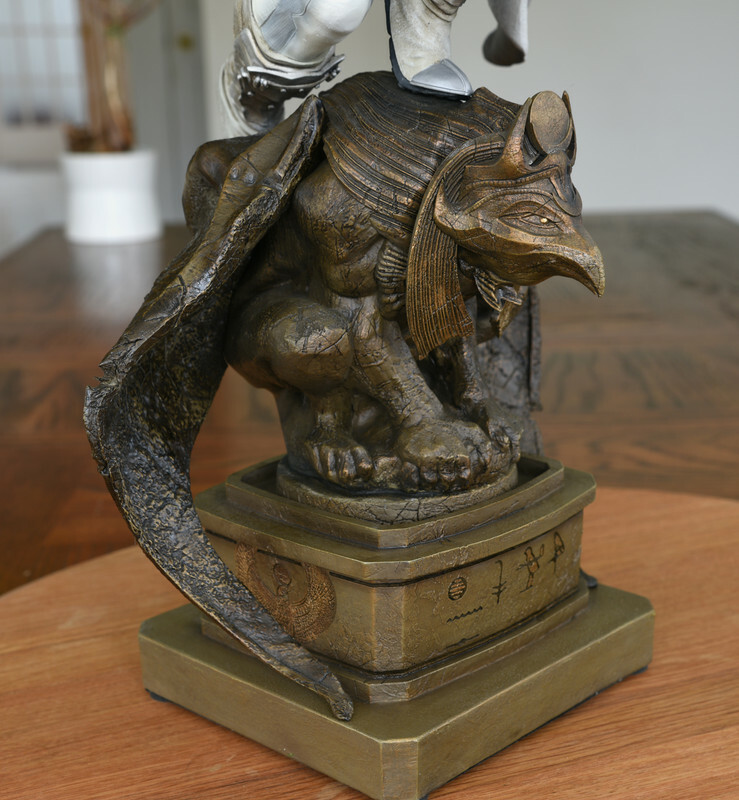 The statue comes with a relatively easy to follow assembly booklet which identifies what goes where, when, and how. Very helpful. 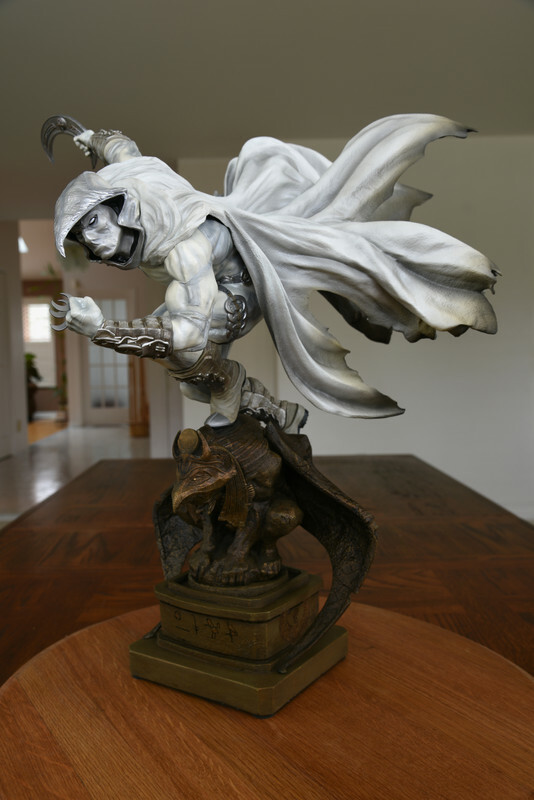 Design: This design exemplifies the madness that consumes Moon Knight. He does not skulk or prowl in the shadows like the famed caped crusader. He wants his prey to see him coming. He wants the fight. He revels in the fear he incites in the depraved and the degenerate. This design embodies the character’s twisted, unwavering confidence and unstable psychological structure, and dare I say, perhaps a subconscious deathwish as well for Marc Spector’s covenant with Khonshu comes attached with the curse of immortality. Deathly wounds that would kill any mortal hero are restored to full health by Khonshu, the God of Vengeance, thus allowing Moon Knight to continue inflicting his brand of vigilante justice wherever it’s needed. 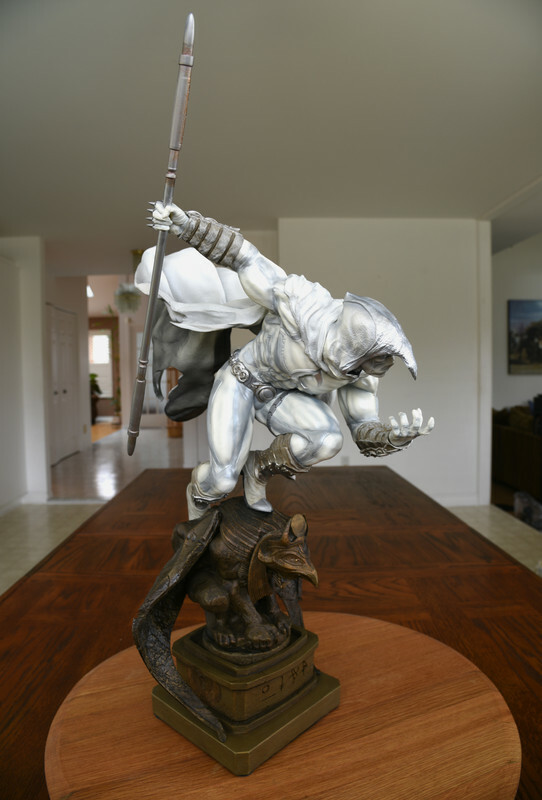 The Moon Knight does have a display limitation worth mentioning. 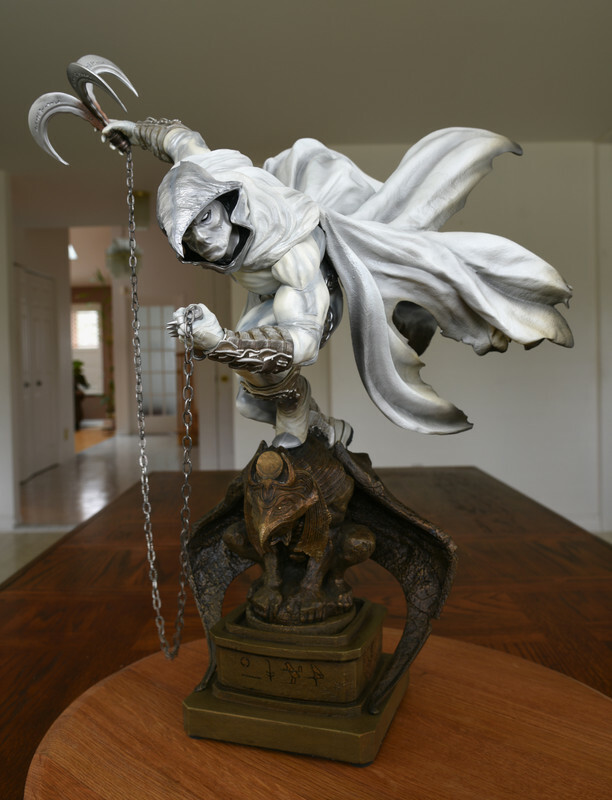 As Moon Knight is essentially crouching downwards, in order for the design to be best appreciated, it needs to be displayed at a good height so you can appreciate the intentions of the piece. He is supposed to be looking down on the denizens of the criminal underworld. 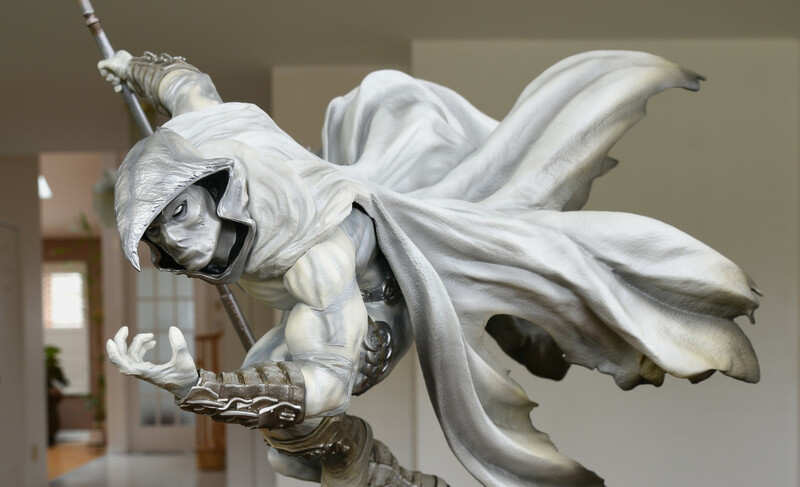 Final thoughts: Caleb Nefzen and the XM Studios design and development team offer the fanbase with a truly iconic interpretation of Moon Knight, the unrelenting and unforgiving fist and fury of Khonshu. 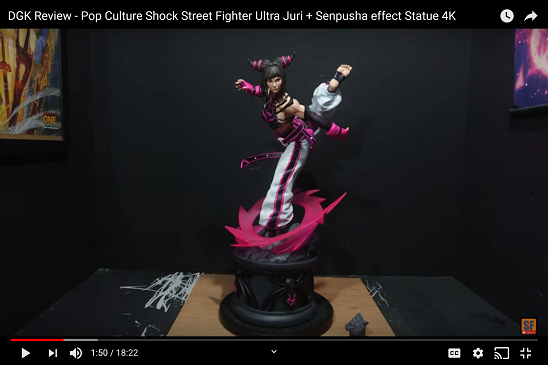 I was fortunate enough to have seen this marvelous statue in person at the STGCC in September 2017, and it looks just as outstanding now as it did then. I must commend XM Studios for presenting the fanbase with a design which typifies both the heroic and unhinged aspects of Moon Knight. This is a spectacular piece.